While you stand outside in The Collector's gardens, keep your ears engaged to hear audio he's accumulated. I caught a snippet from Disney's Great Moments with Mr. Lincoln stage show and Neil Armstrong's moon landing. The mysterious cocoon was originally seen in The Collector's fortress in Guardians of the Galaxy. Before Vol 2., it was a fan theory that the cocoon held a hibernating Adam Warlock. 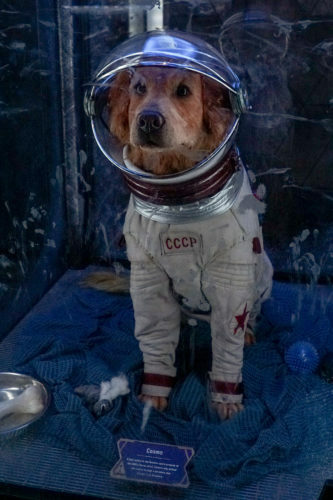 Cosmo the Spacedog is back under the watchful eye of Tivan. Keep an eye on his head in the case, it's animatronic. Also, please take note of the ripped stuffed raccoon toy by his feet. 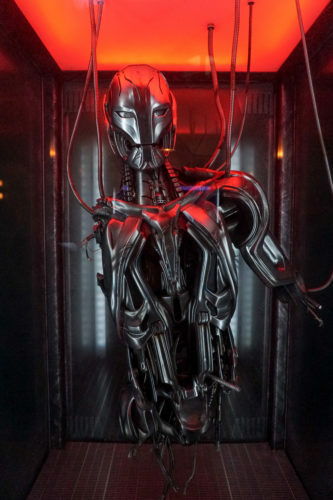 It can't be a good thing for an Ultron Sentry, first encountered in the MCU in Age of Ultron, to be on display... especially considering it still has some juice. 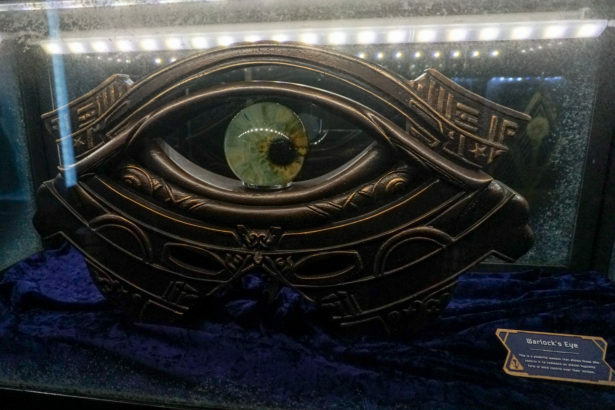 The Warlock's Eye was in Odin's Vault in Thor, but it's, uh, found a new home. 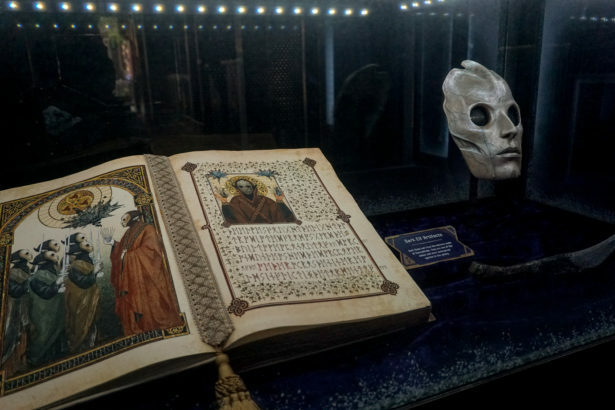 Staying in the realm of Thor's adventures, Tivan has a few Dark Elf artifacts that may be familiar from Thor: The Dark World. There's a mask, blade, and illuminated text. Figment, the little purple dragon from Epcot's Journey Into Imagination, appears to have been captured by Tivan. He's hard to see, but a case on the upper left changes colors from orange to purple (Figment's colors) and you can make out the shape of his arms. The oh so memorable Howard the Duck makes a blurry appearance in the pre-show video as one of Tivan's acquisitions. Would it be a Marvel thing without Stan Lee? He appears in the pre-show video asking about parking validation. 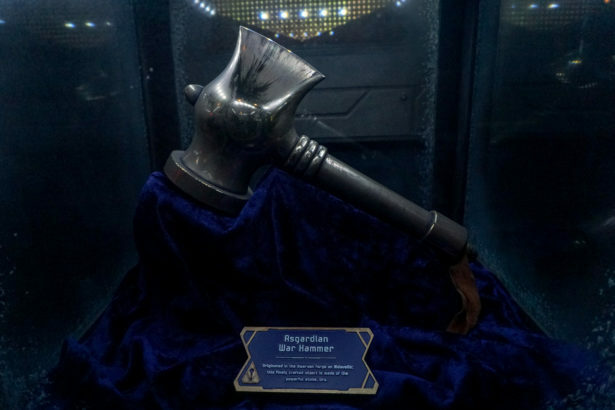 In the front right of the room before you exit the collection, you'll see an Asgardian war hammer that looks an awful lot like Stormbreaker. The weapon belongs to Beta Ray Bill in the comics. 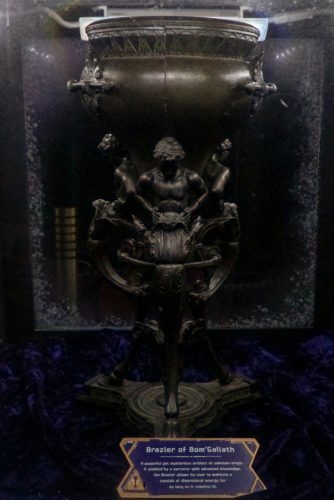 We don't know much about this artifact found at the bottom of the Terran ocean, but it could be a nod to Atlantis and Namor. Disney Imagineer Joe Rohde said it was inspired by the Antikythera mechanism and "a very brief image in another film." He also says, "It has not been activated. Yet." The device kind of looks like an image shown while Star-Lord was in The Collector's fortress, and it appears to have places for the six Infinity Stones. From Agents of S.H.I.E.L.D. history, we have Terrigen Crystals, a Kree Diviner or Obelisk, and a Kree Orb. This weapon was carried by Rocket Raccoon in the first Guardians of the Galaxy film. The Nova Corps uniform is a throwback to the ensembles previously seen in Guardians. Outfits are apparently a Thing for Tivan, because he also has a set of Asgardian guard armor. The Crystal of Conquest has appeared in Doctor Strange and Avengers comics. The plaque in the collection marks it as gem granting an "exceptional sorcerer the ability to teleport large or powerful beings across space instantly." Maybe we'll see Strange use this in Thor: Ragnarok. These masks belong to Celestials. From left to right on the top row, we have Gammenon the Gatherer and Eson the Searcher and from left to right on the bottom row, we have Ziran the Tester, Jemiah the Analyzer, and Arishem the Judge. The Celestials have figured into the Guardians films, with Knowhere being a severed head of a deceased Celestial. Doctor Strange picked up the Brazier of Bom'Galiath during the battle at the Sanctum Sanctorum against Kaecilius but didn't know how to use it. Tivan's found a purpose for it. This masterpiece of a painting (located on the left as you face the entrances to The Collector's office) features The Collector and the Grandmaster. The caption says, in Celestial, that the art is by Ryan Meinerding, Marvel Studios Head of Visual Development. Thor's pals the Warriors Three have seemingly lost their weapons to Tivan. This part is variable because there are two offices; you'll have to ride more than once to catch everything. Remember the restraints Doctor Strange used on Kaecilius? The Collector has them, or restraints like them, on display. Need a shiny fruit that, in the comics, grants Asgardians youth and vigor and all things awesome? Tivan has them in his collection with the Golden Apples of Idunn. They're stacked in a bowl and loose on his desk. The gun Phil Coulson shot at Loki with in The Avengers has found a home in the Tivan Collection. A small Mickey Mouse toy is tucked away in the back corner of The Collector's shelves. 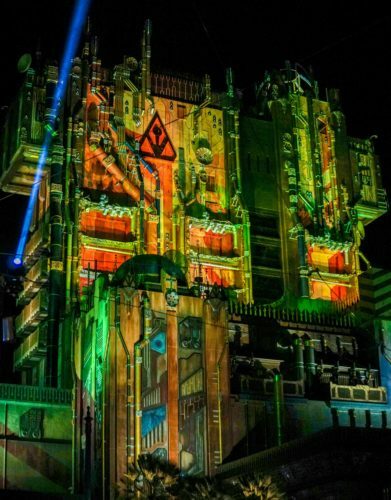 Mission: BREAKOUT! replaced The Twilight Zone Tower of Terror, and Tivan's Collection holds a couple of relics. If you examine the office, you'll find a bellhop hat and a bookmark with the Hollywood Tower Hotel logo. Hat tip to Inside the Magic for noticing these ones. The Collector has encountered Hydra or been to a Hydra surplus store at some point, as this is a Hydra soldier helmet. We've seen them in the comics and in Captain America: The First Avenger. Thanks to Eric Diaz for helping me with this one! Star-Lord's walkman is in both offices. Follow Rocket Raccoon after he shares his plan, and you'll see the walkman. On Tivan's desk, you can see he's written a letter to Jeutar Morat to ask about the movement of a stranger headed to Terra. In the comics, Morat is a bounty hunter who tired to hunt down Gamora. Also on Tivan's desk, you'll see an invoice from X-S Tech. That's a call out to an attraction that used to exist at the Magic Kingdom, The ExtraTERRORestrial Alien Encounter. In it, X-S Tech is the fictional alien corporation in the story. One of the original animatronics of the yeti, affectionately known as Harold, from Disneyland's Matterhorn attraction has found itself in the Tivan Collection. You can spot him from the upstairs or downstairs queue. To the left of Harold's feet, there are some paint cans. They're labeled as Xandarian paint; Xandar is the headquarters of the Nova Empire. To the right of Harold, you'll see Delores the octopus. She's from the Country Bear Vacation Hoedown, a spinoff of sorts of the Country Bear Jamboree. Delores was the girlfriend of one of the bears (I can't make this up). Thanks to Scott Tipton for helping me out with this one! Look closely behind Delores to see a portrait that used to be part of the Tower of Terror attraction. If you're in the downstairs queue area, you can see what the living specimens in the Tivan Collection eat. You'll see chow for Terrans (people from Earth), Orloni (the type of creature Peter Quill kicked in the first Guardians of the Galaxy), Chitauri (I'm sure you remember them), Abilisk (the creature the Guardians fought at the beginning of Vol. 2), and a Jotunheim beast (that's where Thor and Loki went in Thor). In an area where some clear Collections renovation is happening, you'll spot a dragon statue from Kamar-Taj. Kamar-Taj is a fictional Himalayan location where Doctor Strange trained. You'll find this mysterious hatch just to the right of the ride building. It's a clue about the future of Marvel in Disney Parks. What other easter eggs have you spotted in the queue or during the ride? With so many props, I undoubtedly missed some. Tell me what you've found in the comments. Does this photo from Infinity War spoil Thor: Ragnarok?